With decades of experience, talented traditional music specialist Bob Frank teaches students the vital role music played in the daily lives of pioneers and our American ancestors. 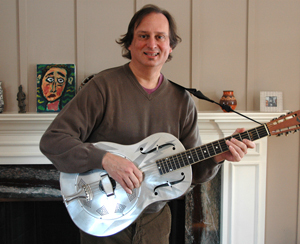 Bob’s musical specialties include Americana and the Blues, among others. He has toured both nationally and internationally as a member of the Hotfoot Quartet and now with his band Blue Lunch. Bob’s blues programs are provided in collaboration with the Cleveland Blues Society. 34 years with Young Audiences/Center for Arts-Inspired Learning. Over 3500 performances.